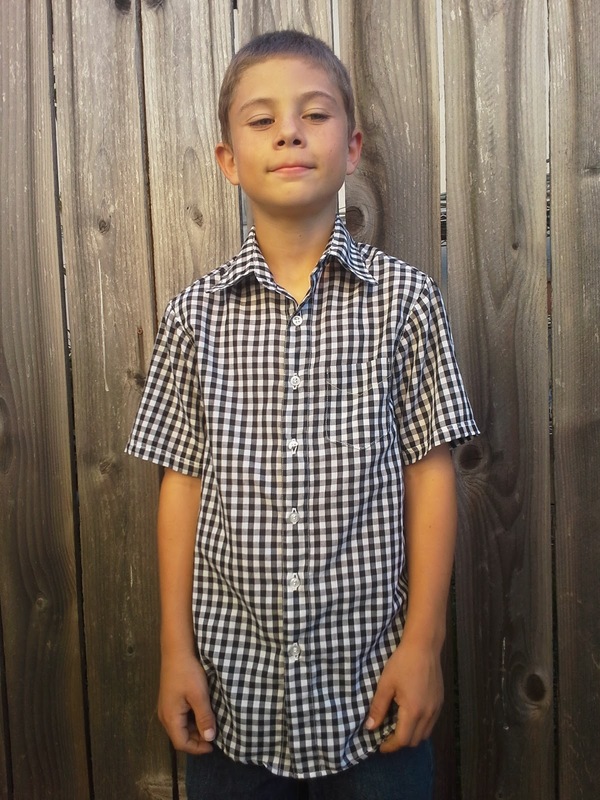 Mrs. Toad Sews: Gingham Ethan Short-Sleeved Finished! Youngest Son likes to ham it up for the camera. 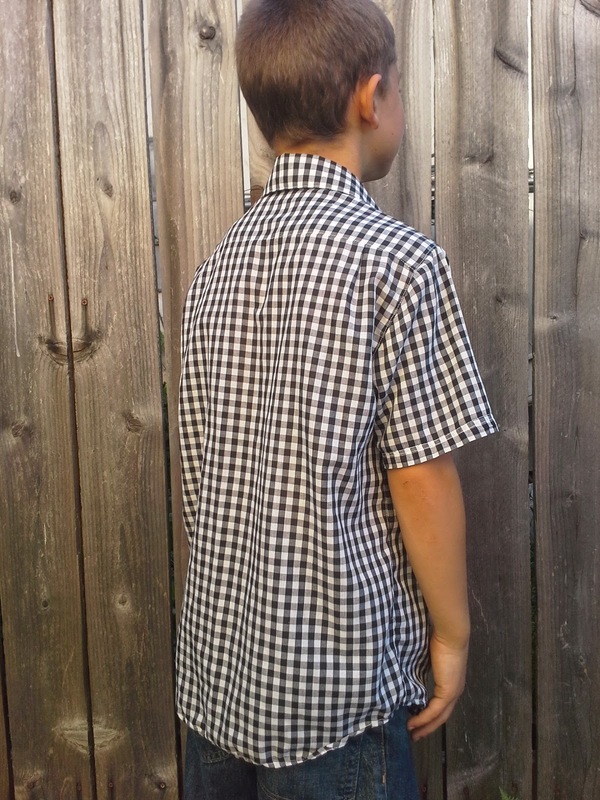 After much fun matching the lines and checks, Youngest Son now has his black and white gingham short-sleeved Ethan. If you remember, it started with planning the layout to match up the pattern. Followed by overcoming problems with matching and resewing to make sure that the pattern matched. It did take me longer than usual. Part of the reason is that I have been recovering from a rheumatoid flare, then some upper respiratory virus that migrated to a lower respiratory thing zapped my energy levels. I'm finally feeling a little better. I modified this from the long-sleeve with sleeve plackets and cuffs. I did this by shortening to where I thought I wanted it. However, as soon as I cut it, I realized that I didn't account for a hem and flare the bottom. This means that the bottom of the sleeve pucker under the arm. Normally, I would have used a flat-fell seam. With the checks, I decided to sew and then top-stitch. On the sleeves, I used the closest stitch I had to an over-lock. On my Brother, it would have worked extremely well. However, I used my Viking and used some odd zigzag type stitch. 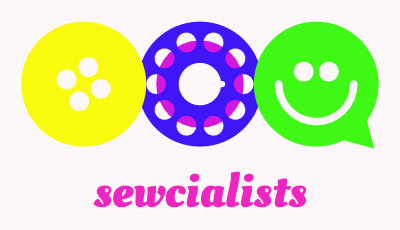 I should have taken the neon thread out of the serger, cleaned it and re-threaded with white thread. 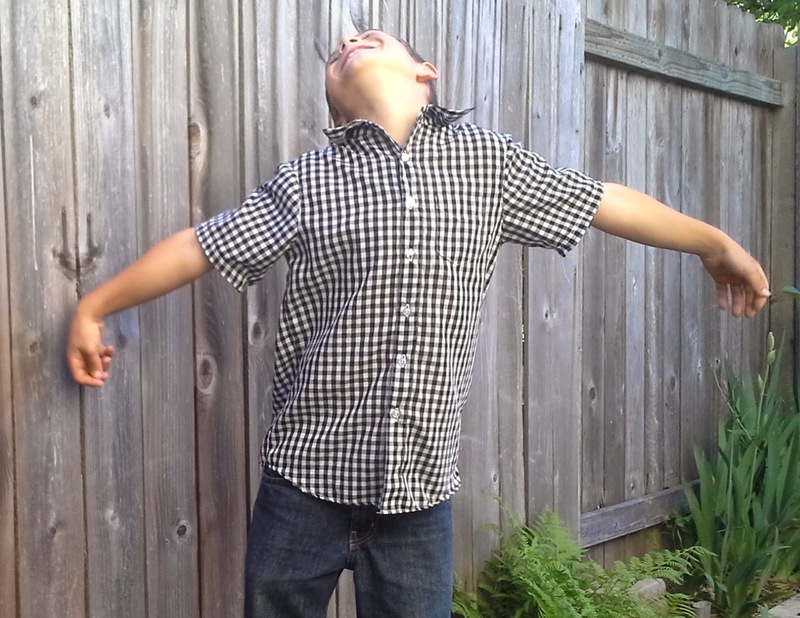 It is hard to get a nine year-old boy to pose. I forgot on the side seams and I just sewed then top stitched. I didn't impress myself. I should have flat-felled and dealt with any patterns being off. I have to say that I really like the way this pattern is drafted. The only changes I might make is to widen the side seams to make a flat-felled seam easier, make a separate short sleeve pattern and have it flare at the sleeve hem, and make an adaption to have a cut-on front placket to make matching patterns easier. Youngest son is already searching my stash for his next Ethan. Middle Son just pulled his fabric out for his Ethan short sleeve shirt for Easter. 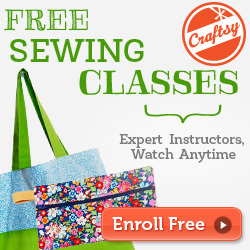 I guess I only have 9 more sewing days. It looks so great on him. You really did a great job. Glad you're feeling better. Thanks! He didn't want t put it on, but then he wouldn't take it off. He said it was keeping him cool. This is fabulous!!!! I can't believe you weren't feeling well during your construction of this. It definitely does not show at all! Thanks, Vanessa. I definitely worked slow. One day I only sewed one seam. Of course, it was sewn, ripped out, and resewn. Love!!! Looks fantastic on him! You inspired me to sew for my son this week. I never have trouble sewing or my daughter but boys are so tough. Finding decent patterns is not easy. Thanks for the posting! Thanks, Vicki. I'm glad your inspired to sew for your son. It seems like the boys, in their own way, appreciate what is made for them. I think it is like Mom making them cookies. If you are up to a button down, I would recommend this one. The directions are extensive. Jalie also has a good t-shirt pattern. 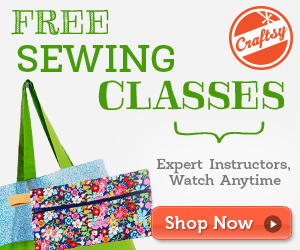 It is a quick sew. The pants/shorts I have are no longer in print, but I will be making some this week.